Due to a previous contractual agreement, Jason Hayward does not appear on the signature bat. Bats are not matched numbered, but these limited 3 bat display racks are numbered to 2,016. For Cubs fans 108 years of waiting is now over ... the Chicago Cubs are World Series Champions! To honor this team and celebrate an amazing season we are pleased to offer Cubs fans this very special Three Bat set with custom Chicago Skyline Bat Rack! 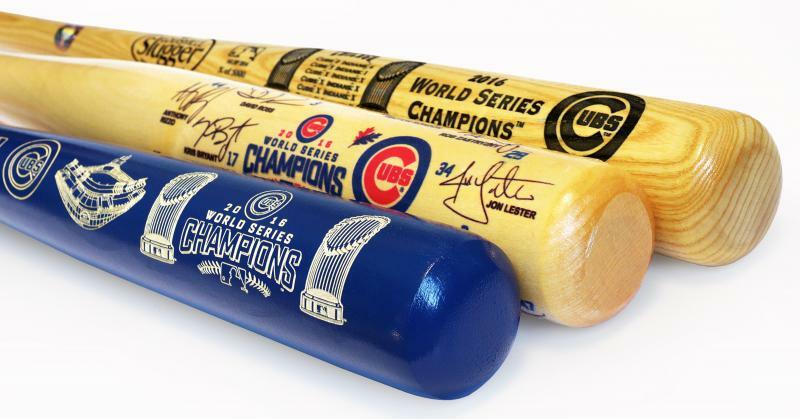 Each set includes one (1) Cubs World Series Champions Team *Signature Bat, one (1) Cubs World Series Champions Full-Size Louisville Slugger Bat, one (1) Cubs World Series Champions Two-Tone Bat, and a FREE numbered Custom Chicago Skyline Three Bat Display Rack. This unique three bat set is unavailable anywhere else, but BigTimeBats.com is offering it for a limited time. Due to the unique nature of this offer we must charge your credit card for the full amount immediately upon taking your order. This policy ensures we reserve a set for you. We will confirm your order by Email. These bats are not game used. Please allow 4 to 6 weeks for delivery. 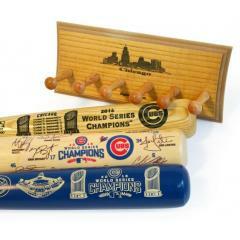 *Team Signature Bat features autograph facsimiles of players on the World Series roster. 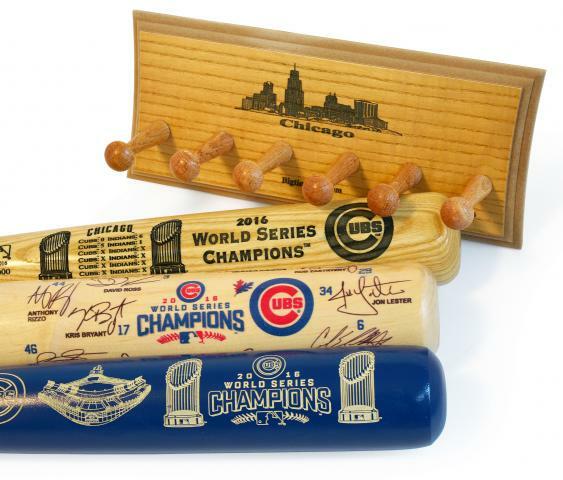 Cubs 2016 World Series Champs Three Bat Set and display rack $389.95 Sold Out!